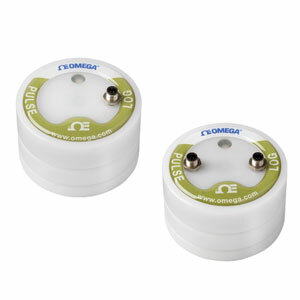 OMYL-M41 (one pulse input channel) and OMYL-M42 (two pulse input channels) data loggers are designed to measure potential-free (dry contact) pulses or voltage signals up to 3V using the included OMYL-CS input cable. With the optional OMYL-CP connection cable the logger can be used for measuring signals up to 24V. These data loggers are available with standard memory of 100,000 readings (OMYL-M41, OMYL-M42) or expanded memory of 4 million readings (OMYL-M41-4M, OMYL-M42-4M). These devices are fully programmable allowing you to set the data logger to record on one or two channels. The incoming signal type (potential-free or voltage) can be set using the included software. These data loggers are best suited for operation with counters, photoelectric sensors, revolution-counters, make contact elements, switches and sensors such as flow meters or energy consumption meters with pulse output. Both data loggers can also be integrated into the aerodynamic rain gauge OMYL-RG. Once activated the data logger senses and records the number of pulses/contact closures that occur within adjacent “time bin” periods. The bin period is selectable from 1 second to over 24 hours. At the end of each bin period, the total number of pulses/counts within the bin period is recorded. The data logger then starts another bin period and continues until either the memory is full or the test period has ended. Nota: Comes complete with 3V lithium battery (standard temperature range), OMYL-CS pulse input connection cable for pulses < 3 V, 1.8 m (6') USB interface cable and OMYL-SOFT software, and operator’s manual on USB stick.